What kind of house would you dream of creating after spending decades in a six-foot-by-nine-foot cell? In 2001, Herman Wallace, a prisoner at the Angola Prison in Louisiana, received a life-changing letter that asked that question. Herman’s House is the acclaimed documentary about his decades in solitary confinement–and his friendship with a New York artist who asked him to imagine different walls. Herman Wallace is one of tens of thousands of people held in solitary confinement in the United States, even after the UN’s Committee Against Torture has recommended the abolition of the practice. Herman’s House provides a closer look at its devastating effects and an artist’s mission to call attention to its injustice. Hanson Film Institute, and Read Between the Bars. 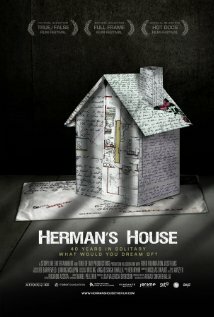 Dazed and Confused Magazine (UK) calls it a “shrewd indictment of solitary confinement…a protest movie without being sententious.” You can view the trailer at www.hermanshousethefilm.com and follow it on Facebook at www.facebook.com/hermanshousethefilm and on Twitter at @hermansfilm. Following the film screening, there will be a brief panel and discussion. For directions and information regarding parking at the Center for Creative Photography, please visit www.creativephotography.org/visit. The following evening, ACLU Arizona and AFSC Arizona will host a community forum called Arizona Is MAXED OUT. The forum will look at the high costs of solitary confinement and its ineffectiveness at making our communities safer. Each year thousands of people are held in solitary confinement in Arizona, and the state plans to add hundreds more maximum-security prison beds. The forum takes place at St. Mark’s Presbyterian Church (Geneva Room), 3809 East 3rd Street, Tucson, Arizona, from 6:00 to 8:00 p.m. on Wednesday, September 19.